A man limps awkwardly on to the stage, mimicking a mouth twisted to one side, head bent towards his feet. The audience laughs at the sight of him. “Got the hump?” jokes the ringmaster and there’s a titter from the stalls. The ‘hunchback’, as he’s commonly called, is a figure of fun and the pitiful foil to the statuesque, elegantly dressed and un-twitching man in a riding jacket and top hat. This scene is from Circus 1903, an “over-the-top fantastical celebration of mind-blowing performances” at the Southbank Centre in London. But part of this ‘celebration’ involves laughing at disability, without asking whether this is appropriate in 2018. Circus and disability have a troubled past. Strictly speaking, the popular images of freaks in the 19th century, originating in America, do not depict circus people at all, but sideshows. In the 1860s, Charlotte Teeple – the Fat Lady – was not in a circus but in a shop front in the arcades off Regent Street and Piccadilly in central London. The Greatest Showman’s portrayal of PT Barnum as a disability rights campaigner is far-fetched not because of his real attitude towards impairment, but because the skeleton boy and the bearded lady would never have appeared in any ring, including his own. These disabled people’s tricks were not, in contrast to the acrobats and aerialists, extraordinary death-defying feats. They did very ordinary tasks which only became extraordinary because of their disabilities. The Armless Man shaved himself with his feet. The 19th-century Legless Wonder and the Armless Wonder rode a bicycle between them. So why has Circus 1903 introduced disability to the ring? To make us laugh. But it is not okay, nor artistically interesting, to encourage audiences to guffaw at an actor pretending to be disabled. Disability in circus doesn’t have to be like this. Just a few miles from the Royal Festival Hall’s prestigious stage, at Winter Wonderland in Hyde Park, Brazilians Rafael Ferreria and Alan Pagnota performed a hand-to-hand balancing act in Cirque Berserk’s Inferno. Ferreria uses a wheelchair. The duo are simply presented as artists. We’re not invited to laugh at the disability. 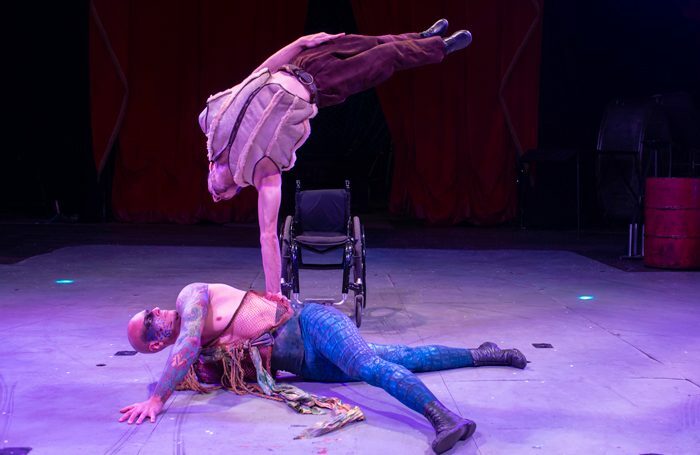 As Claire Teasdale, executive producer of inclusive circus company Extraordinary Bodies, has said: “Having disabled performers immediately increases the emotional content, and makes people sit up and watch, which is what every director wants.” As with Ferreria, disabled performers can make us feel a fabulous, raw awe. In contrast to being marvelled at for doing something everyone else takes for granted, this is a disabled person doing something extraordinary in itself. Perhaps there’s a quick test on dealing with disability in circus. Would a young disabled person in the audience see the performer as a role model? It’s clear with Circus 1903’s parody of a ‘hunchback’, they would not. But when Ferreria balances upside down on one hand on Pagnota’s head, who wouldn’t want to do that?